Nothing will stop Hamas’ drive to celebrate the first anniversary of its violent “March of Return against Israel at the end of this week – neither Egyptian mediation, generous Qatari- and Israel economic largesse, which the United Arab Emirates recently offered to join, or even the massing of an Israel war army on the Gaza border. The Palestinian terrorist group is determined come what may to mark the event with hundreds of thousands of rampaging mobs hurling IEDs at IDF forces and forcing their way across the border into Israel. Hamas leaders view this peak event as a kind of victory march. It was presaged Wednesday night, March 27, by attacks by hundreds of Palestinians tossing explosive devices and hand grenades at Israeli troops along the border and floating more explosive balloons over Israeli farms. The Egyptian officers who sat down Wednesday in Gaza city with Hamas leaders knew the score: they had no hope of talking those leaders around to exercising self-restraint and curbing the demonstration of arrogant violence planned to mark their anniversary. Neither were the Egyptian officers able to sell Israel the well-worn line that by turning the other way when the Palestinian terrorists went on the rampage, calm would follow. This gambit has proved too often in the past to be a reward for terror. The claims that Israel has laid down tough terms for Hamas are deliberately misleading. For months now, Israel has lost its deterrent strength against the Palestinian terrorists in the Gaza Strip and it is now Hamas which is dictating terms. The only way to break out of this ill-fated pattern was for the IDF to go into the Gaza Strip on Wednesday and conducted a pre-emptive offensive to spoil Hamas’ victory march. Since this was not decided at the drawn-out deliberations taking place between PM Binyamin Netanyahu, who holds the defense portfolio, chief of staff, Lt. Gen. Aviv Kochavi, National Security Adviser Meir Ben-Shabbat and Shin Bet security service director Nadav Argaman, the initiative remains in the hands of Hamas. Failing resolute Israeli counter-action, the security situation centering on Gaza will therefore continue to decline in the coming days. Buy bombs with a non lethal painful nerve gas. And have bombers in the sky to throw it at the rioters. If this does.not help prepare fighter airplanes with onbord cannons to shoot the rioters from above. And throw napalm as last reserve. If the rioters get killed by shots or by burning napalm they will learn that it is not always a wise move to poke a stick into a hole as there are some holes where a dangerous predador rests. Same.with IDF they shall show that they can fight with deadly force so the Arabs learn that the actions of IDF were at very low polucing level. so the terrorists will pray to never experience IDF at DEFCON 1 which is war. what, in your opinion is the problem with Israel’s infantry? I haven’t heard anything to indicate that Israeli infantry is sub par. of course Israel can win wars , but indecision and rulers that profit from such , will never bring it to a solution ;If exterminating is a solution for Arabs , which is sad , than the decision making is not there to solve it once and for all.Peace needs to be an agenda and economic development . Than good will will find its way.. Your ‘final solution’ relies entirely on the welfare of your benefactor. Without Uncle Sam, the apartheid squatters can do nothing. With them, they can murder from 35,000 feet. But nothing will give the squatter army courage. Neithet, apparantly, can 57 Islamic nations with the support of the vilest humans in history. Go Israel! What ever you do, do not help the Hamas to derail THE PRESENTATION of the Trump peace plan. After which event, it is Ok to grab West Bank and bring it back to Israel where it belongs. Many countries of the world are against Israel. Their protests and complaints will not matter. Show NO mercy to these marchers. Get rid of this weekly problem once and for all. They had too many chances, but they still chose violence. Take back Gaza and the West Bank permanently. The world hates the antisemitic squatters because they do nothing but cry about how hated they are while killing medics, grandmothers, and hundreds of other unarmed demonstrators. I dont. I love them! GAZA and its resident Terrorists are just a distraction or a minor annoyance if you will. The real threat or action to take place will come from the area of Syria. At that time, you will find the pitched battle that many are so looking forward to ! You will see Israel will be forced to NUKE Damascus during the “eveningtide” and finally GAZA and the West Bank will revert like a “whirlwind” to Israel . “Peace and Safety” will be the hue and cry of the land ….. for a time. It seems like I might have heard this somewhere before . He who chooses war at the right time instead of crazy raids of vengeance, gets the good spoils and wins the war. The Palestinians must stop their war called “march”. Send an ultimatum to Abbas with the steps and terms, Palestinians must unconditionally surrender all heavy weaponry, the political responsible and the military and paramilitary commanders. Does not comply? Arrest and intern all administration where possible and available to reach easily and replace with IDF personnel. Then, deal with the Palestinian fractions still fighting. “Heavy weapons”: stethoscopes and balloons. But, what about all rubber tires, but I mean all of them, spare wheels too. B — 52 — Wing Tip to Wing Tip — Block Buster Rain ! Esau’s Remnant Must Experience Justice ! When in doubt just send in the Air Force to demolish a few more empty buildings. Israel has invented a non-lethal sticky, foul smelling liquid they have used to break up mobs of rioters. Surely they will be considering using this. 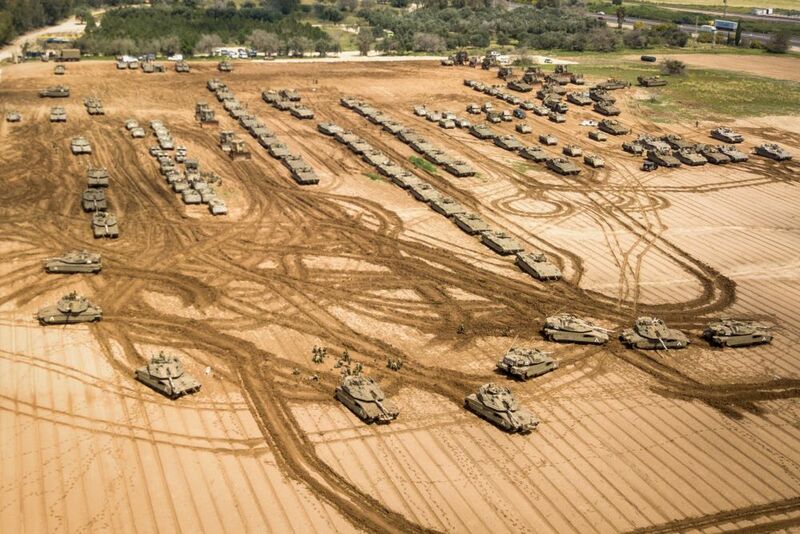 Does the nation of Israel have the will to militarily defeat hamas in gaza, judea and samaria. I think the united states would support it under Trump. This is a failure of leadership. The PM must go.